This weekend we took Ava to the theater to see her first movie on the big screen. The movie we saw was the third in the Pirates of the Caribbean franchise; and at nearly three hours long, we weren't sure if Ava would make it through. However, she was quite enthralled by all of the swashbuckling action, sitting through all 160 minutes without making so much as a peep. As you can see above, Ava was quite taken by Johnny Depp's portrayal of Captain Jack Sparrow, desiring to be one of his shipmates. 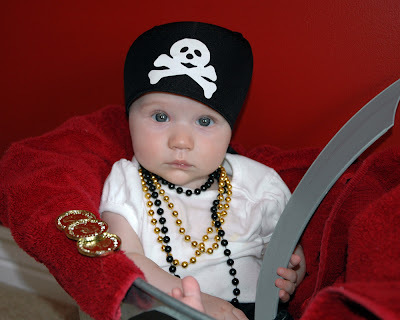 Dressed as a pirate, she set sail in her tub in search of the Black Pearl and humming "yo ho, yo ho, a pirate's life for me." We tried to get her to smile for the camera, but she was determined to stay in character, her eyes set on the horizon where vast treasures awaited. 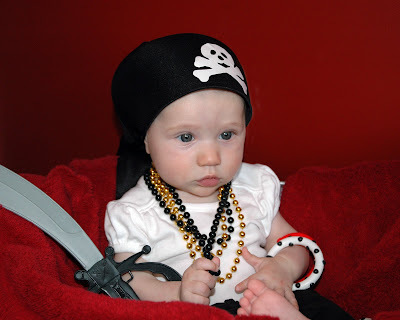 Later in the day she returned from her voyage with several gold coins she pillaged during her pirating. 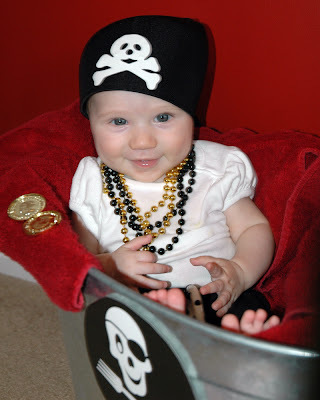 With her treasure plundering behind her, she was finally willing to smile for the camera. During all the excitement we noticed that her sabre was missing and asked if she had perhaps decided to give up the pirate's life. She deftly retrieved her sword from below deck and brandished it as she gave us the most menacing pirate look she could muster. I guess we'll know not to ask that question again. 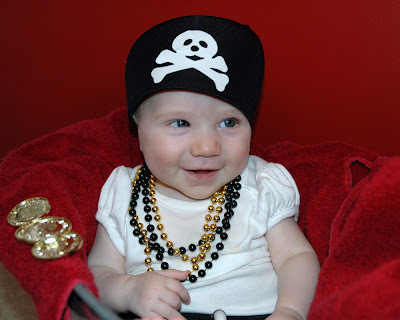 Ava is such a cute little pirate! 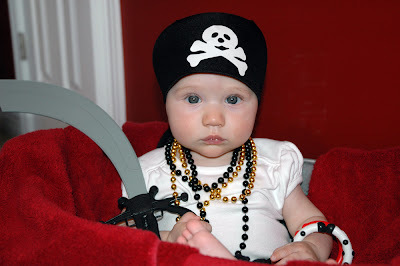 I just love her pirate look. This is too cute...you guys are so creative, and it looks like she really enjoyed Pirates :) Good job Ava for sitting through it!! We took Klous to Shrek the Third this weekend and he did great as well!! Guess it's a kid thing!! Anyways...she's so dang cute...but you already know that! !